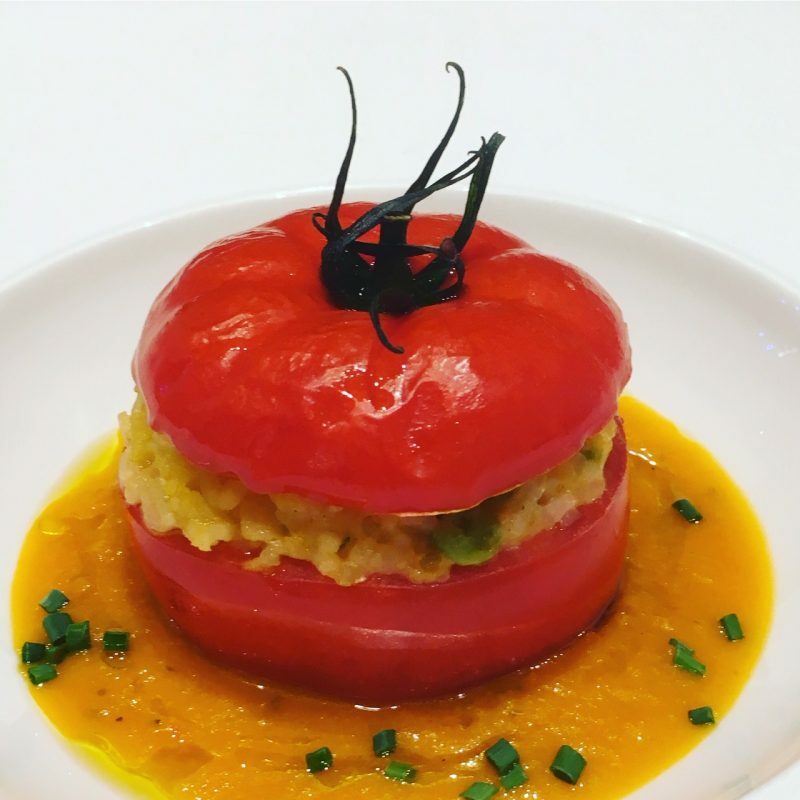 We have served these stuffed tomatoes at La Villa since our opening year (2009) – they are always a hit with our guests. Start by making the sauce. Heat the olive oil in a medium sized pan and add the onion, garlic & thyme and sweat down for a few mins. Add the chopped tomatoes and the tomato purée and cook for roughly 10 mins. Add the water, seasoning and sugar and cook for a further 10 mins. Remove from the heat and, if using fresh thyme, remove the sprigs. Pour into a blender and blend until smooth (you can pass through a sieve if required). Set aside. To make the stuffed tomatoes themselves. Start by cutting off the tops of each with a very sharp knife. Run the knife around the inside, being careful not to pierce the tomato itself – spoon out the insides and reserve the pulp (you need 150 ml). Scrunch up one square of kitchen paper and pop inside each tomato (this will help absorb the moisture) and pop the lid back on – set aside. Prepare all of your vegetables and set aside. In a large pan or wok, gently heat the butter with the thyme & bay leaf. Stir in the rice and cook for 1 min; add the water, carrot and the reserved tomato pulp and season with salt & white pepper. Cook for a further 5 minutes, stirring occasionally. Add the celery, courgette & peas and cook for 15 mins. You may need to add a little more cold water from time to time. Taste and adjust seasoning, finally stir in the cheese & cream and remove from the heat. Allow to cool for 30 mins and then spoon into your hollowed tomatoes, pressing down gently so they are tightly filled. Allow the mixture to be slightly above the rim so that when the lid if placed back on there is a slight gap. Set aside or, if making in advance, cover when cold and pop in the fridge. To cook & serve – heat your oven to 180 degrees and place your stuffed tomatoes on a lined baking tray and cook for 15-20 mins. Re-heat your sauce. Place a small ladle of sauce in a warmed soup bowl, place your cooked tomatoes in the centre and finish with a sprinkle of finely chopped chives & a drizzle of olive oil.